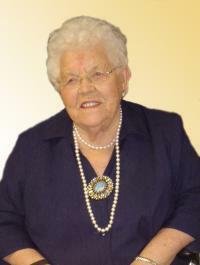 Mona DeGraaf went to be with the Lord on February 3, 2012, surrounded by her family. Mona will be lovingly remembered by her family, Jean Siebenga, Ina van Doesburg, Ann (Clarence) Wielenga, Teresa (Tim) Jonkman, Lorraine (Ken) Harmata, Mona Clarkson, Wayne (Grace) DeGraaf and Thomas (Glenda) DeGraaf; 36 grandchildren; 52 great-grandchildren; one great-great-grandchild; as well as numerous family and friends. She was predeceased by her husband, Jarich; daughter, Catherina Van Der Werff; 4 sons-in-law; one granddaughter and one great-granddaughter. Visitations will be held on Monday, February 6 at Foster & McGarvey Funeral Home, 10011-114 Street, from 7:00-9:00 p.m. Private family interment at Westlawn Memorial Gardens. A Memorial Service will take place on Tuesday, February 7, at the Orthodox Reformed Church, 11610-95A Street, Edmonton at 1:00 p.m. In lieu of flowers, donations may be made to Word & Deed Ministries, P.O. Box 20100, St. Thomas, ON, N5P 4H4.